Posh Pooch Designs Dog Clothes: 12 Collars of Christmas # 11 - Snowflakes and Gems! 12 Collars of Christmas # 11 - Snowflakes and Gems! 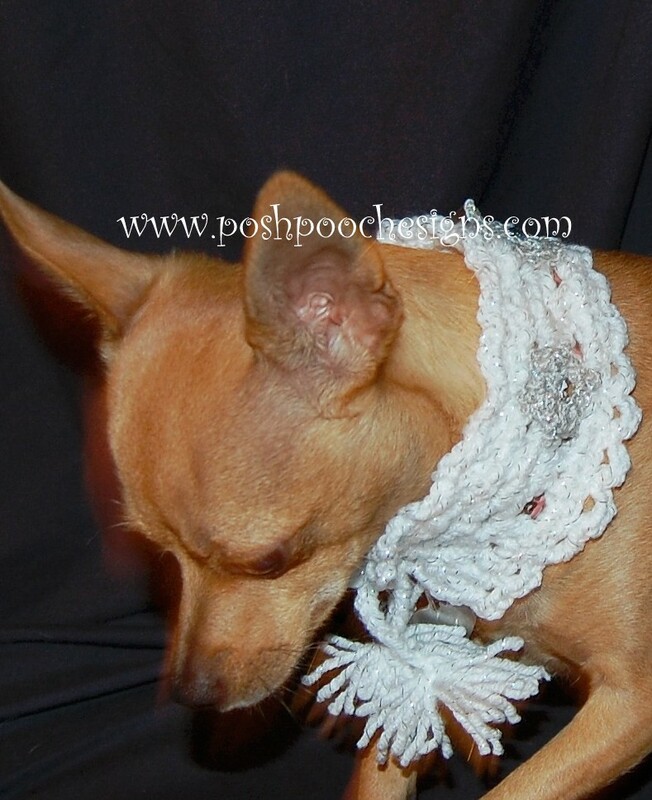 12 Collars of Christmas , # 11 of the Free Crochet Patterns for Dog Collars. 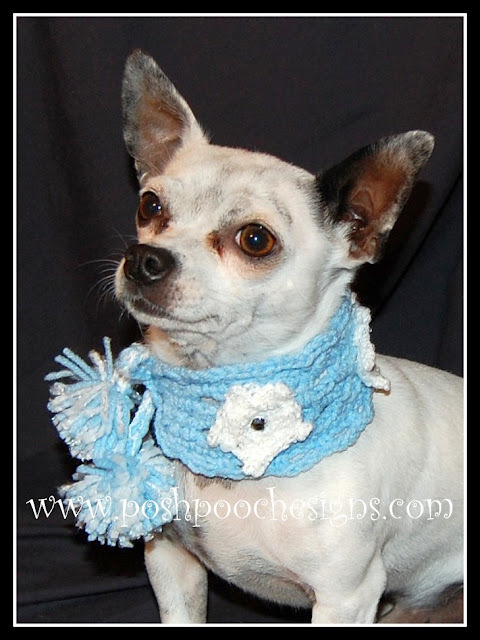 As I was designing this collar I wanted something that said "Winter"! crochet blanket, tied pom poms on, attached snow flakes and gems that glitter all on one collar!!! just be adding some length to it. You and your pooch could wear matching bands. Wouldn't that be fun? ! R - 5 : 1 sc in each st and ch across row, do not tie off. (*sc ch3, skip 2 sts, sc) for an edging. ch 55 and cut yarn, tie a knot in each end and lace through the middle of both ends of the collar. Pom poms : Wrap one strand of each yarn around your three middle fingers 25-30 times, lace another piece of matching yarn through the hole and tie very tightly, attach to end of tie with another very tight knot. make one for the other end also. 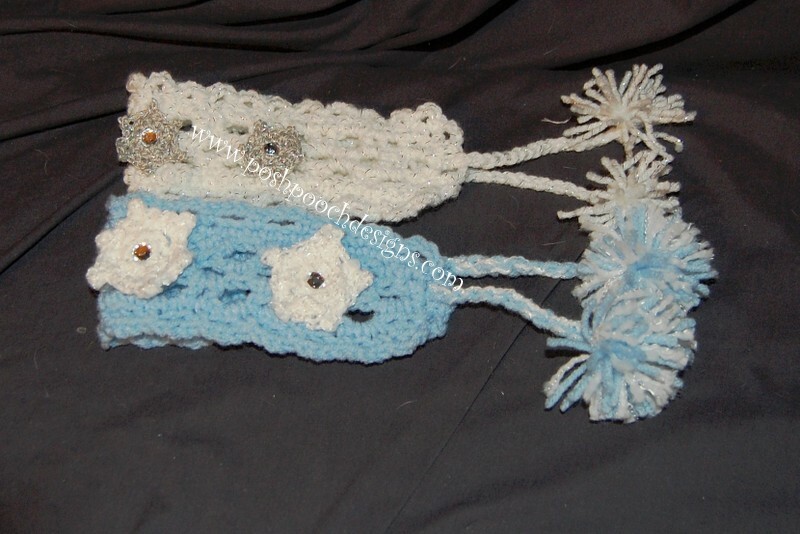 R : 3 - ( sc, picot, sc) in each 1 ch "space", join, leave a 8 inch tail of thread to sew snowflake on to collar. Gems: use fabric glue or Hot glue to fasten one gem to the center of each snowflake. do not attach your leash or lead to it, it is not strong enough, even on the itty bitty dogs. very cute! I love the snowflakes and pompoms! Christmas Photo Shoot -- Didn't go so good! 12 Collars of Christmas #10 " Black & Silver"